I’m sure you’re familiar with the phrase, “I didn’t choose it, it chose me.” That phrase applies to me and paranormal writing. I grew up reading romance novels—the old school romances with covers that depicted revealing bodices for heroines and exposed chests for heroes. Fast forward to adulthood and my love for reading romance novels continued. So it was quite natural that when I decided to become a novelist, I turned to the romance genre. I wrote three romances and then something unexpected happened…my next love story went dark. Yikes! What happened? I’m trucking along writing about love and eternal bliss and then a stalker, death and violence inserts itself into one of my stories. That story introduced a change. Oh, I still believed in love, happiness, and all that sugar and spice stuff, but those dark elements forced me to acknowledge the influence that murder mysteries, thrillers, horror and science fiction had had on me as well. I had read just as many Stephen King, Edgar Allan Poe, and Sir Arthur Conan Doyle books as I had romance novels, and that horror/thriller/mystery genre had risen up, demanding to be represented. So in 1999, I shelved the romance stories I had been developing and turned to paranormal writing. Well not completely. I decided I would write a paranormal then write a romance; write a paranormal, then write a romance. A rotation, you see, but my intuitive creative self said, “no, no, no,” and to prove it meant what it said I started having personal encounters (yes, plural) with spirits. I had my first run-in in 2000 with a spirit. Then in 2011, I had my second spiritual visit and since then I have seen an angel and have been visited by a deceased relative. Needless to say, many of my writings are now devoted to the paranormal genre. Such as my most recent book titled, Lyrical Darkness. 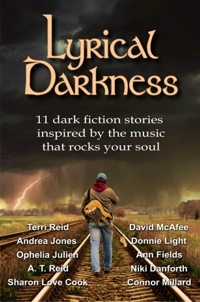 I am honored to be one of ten paranormal writers featured in this collection of short stories that are based on dark song lyrics. I’m curious about you though. What has chosen you? Have you been chosen to take your writing more seriously and work toward publication? Have you received the call to join a book club? Have you felt the urge to sculpt, draw, paint? Maybe thoughts about pursuing a voiceover, design or music career? If so, have you answered the call or turned your back to it? If it chose you and you’re being stubborn, let me reiterate that there’s no escape. Make it easy on yourself and go with it. And always remember, it chose you; hence, all the support you’ll ever need is yours just by asking.